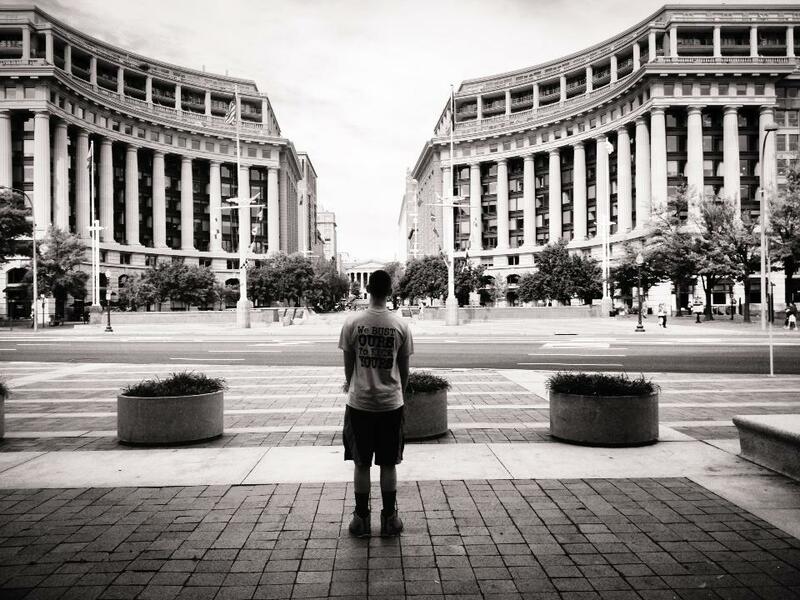 My oldest son, standing in front of the National Archives in D.C. Traveling to a new city always brings with it a challenge to scope out the best running trails. City running is so much different than running in farm country. This country girl is not used to running with traffic, pedestrian crossings, honking horns, and heavy foot traffic. To top it off, this week I had to travel to D.C. and previous experience has shown that this is a very busy city. I could have hidden in the hotel and used the two-treadmill exercise room, with squeaky, shaky equipment, but instead I decided to ask the locals where the best running routes were. I figured I’m not the only runner in D.C., and come to find out I was right. After doing a little research and taking a stroll the evening before my first run in D.C. I felt I was ready as ever. After all, it wasn’t like I was going out into a landscape of sinking sand or had to figure out how to walk on water. All I needed was some ground. The next morning I woke up, laced up my shoes, and powered up my Garmin. I headed out of the hotel and started running in the general direction I was advised. I wasn’t sure really where I was heading, or even how far I’d get before I ran into a wall of people, heavy traffic, or some crazy D.C. event. I wasn’t even sure where the streets led but realized the best way to learn about a city is by pounding the pavement. After about two miles I came across some familiar territory; the Mall and the Capital of D.C. It felt oddly strange to be running on the Mall and around the Lincoln Monument, both places I had visited many times as a child and in my youth. I felt like a citizen of D.C. – as if I belonged in the city. I felt comfortable and safe as I saw dozens, if not hundreds of other runners. I wrapped back around the back side of the White House just as the guards were changing shifts and within minutes had several dozens of police officers surrounding my route. Here I was afraid to run alone in D.C. in the dark and on a new route. Suddenly, I felt safer there than I do in my small farm town in Colorado. on October 9, 2013 at 4:46 pm | Reply Dominick S.
This is one run I would love to see the pics! Love running in new cities…I will add DC to my list. It really was neat to run around the city, including the Mall and passing by the White House. You really should add it to the list. For more backroad routes, there is the Rockcreek Parkway that runs along the Potomac. I ran 9 miles on that route this morning and enjoyed the less hectic pace of the city. on October 10, 2013 at 9:22 am Dominick S.
Catching major metropolitans before they wake is eerie and awesome. Thanks for the tip on the Rockcreek route.